Having complained often and at length about authors who write the same book over and over again I chose to TRICK OF THE DARK up precisely because it was clear from the disparity of opinion about it that, if nothing else, McDermid had written a different book from her previous work. My main exposure to her writing has been through the Tony Hill books which are a bit bloody for my taste though I do like her writing so I was keen to try more of her standalone novels. There were lots of things I enjoyed about TRICK OF THE DARK though my relationship with the book didn’t start well as the main character, psychiatrist Charlie Flint, is angst-ridden about whether or not to cheat on her wife Maria with another woman. I groaned audibly I think as the ‘to cheat or not to cheat’ storyline is a particular annoyance of mine both in real life and in fiction (cheat if you must but don’t bend my ear about your vacillation is my motto). But even though that thread does run throughout the novel I thoroughly enjoyed the rest of this complicated and fast-paced book. As well as considering embarking on an affair, Charlie is in professional disgrace as the book opens due to an assessment she had made in a criminal case. Although something of a side thread I found this quite fascinating as it explored the notion of guilt and whether or not people can or should be prevented by society from committing crimes they’ve only thought about. One morning she receives some curious news clippings in the mail about a murdered bridegroom she doesn’t know. After some plot contrivances she works out that the clippings have been sent by one of her tutors from her time at Oxford and the widower of the bridegroom is Magda, whom Charlie knew as Maggot when she used to babysit her some years ago. When she gets in touch with the tutor, Corinna, she is is asked to investigate Magda’s husband’s murder. Corinna doesn’t think the two people who have been found guilty of the murder were responsible, instead she blames Magda’s new love interest, a woman called Jay who is also a former student of Corinna’s and is now a very wealthy business woman. Corinna tells Charlie that if she does not investigate and find evidence of Jay’s guilt Corinna will do whatever it takes to protect her daughter from the woman she perceives as evil. That’s about as simply as I can summarise the early part of the book and it gets more complicated from that point on but it’s surprisingly easy to follow. 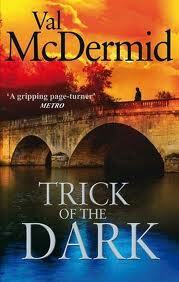 Though perhaps that’s just because McDermid has the skill to make such twists and turns look easy. The book does require the suspension of disbelief but I had no trouble doing that, quickly getting caught up in the whydunnit aspects of the novel and the lives of its three main characters. In some ways I thought Charlie the least interesting of the three (though admit that’s mainly because I was bored by the whole cheating thread). Jay Stewart, whose point of view much of the story is told from, would be intriguing I think even if you weren’t always wondering in the back of your mind if she is a serial killer. She has already published one book, a misery memoir of her horrid childhood, to much acclaim and has been persuaded to write a second biography. This volume will focus on her more recent life of ‘triumph over tragedy’ and we learn about her life as she writes different chapters though readers are always aware of the unreliable nature of Jay’s ‘recollections’. It would be a terrific sign of society’s maturity to be able to write about this book without mentioning that the three main characters (and several minor ones) are lesbians but the women’s sexuality is a significant factor in the stories. Their various experiences of coming out (or not doing so) and being on the receiving end of homophobia significantly colours the lives of all the lesbians in the story and so is an integral part of the book. Unlike some of the more vitriolic reviews on Good Reads and Amazon I thought this aspect of the book was handled sensitively and intelligently. TRICK OF THE DARK managed to draw me into subjects and worlds I have no experience of including the cloistered atmosphere of Oxford college and its lingering pull on all who attend, as well as the tribulations of being gay and hated for that fact (in my bubble world I like to think we’re all grown up about such things now but clearly not). Having had somewhat ambivalent expectations of this book through reading very positive and very negative reviews I was pleasantly surprised and would recommend the book to those who can suspend their disbelief in the interests of a ripping, and thought-provoking yarn. This entry was posted in book review, England, Val McDermid. Bookmark the permalink. Yes I much prefer her standalones to the Tony Hill series. I thought ‘ A Place of Execution’ wonderful and it is set literally on my doorstep in Derbyshire. I have ‘A Darker Domain’ to read and now I quite fancy this one. She is a very engaging personality isn’t she? Great review, as usual, Bernadette. There was lots to like about this book but I found it a bit “written by rote” compared with some of her earlier ones, especially the aforementioned standalones. I think this one is technically brilliant but just did not click for me- and when the final villain is revealed I did not think the motivation/actions credible. But the book is certainly readable (“page turner” an apt description!) and there is lots to like about it. Bernadette – Thanks for a top-notch review. McDermid certainly does have a lot of talent, and I do like the way she can weave plot threads together into a cohesive pattern. I like her standalones very much, too, although I think Carol Jordan and Tony Hill are great characters. I’m intrigued by the plot of this one. Maybe I’ll try it as I haven’t read this author yet. I was under the mistaken impression that most people were grown-ups about homosexuality too, but recent gossip about someone in my area has convinced me otherwise. This sounds like a very good book for the many reasons you’ve outlined. I have read two books by Val McDermid, one in her series about a journalist, which I liked, and the other I can’t remember really. I have several of her stand-alone titles on my TBR list, including A Darker Domain and A Grave Tattoo. A Place of Execution presented by PBS here, from the BBC, with Juliet Stephenson, was brilliant in all ways. It’s horrendous that homophobia still comes out from under a rock at times. I’m surprised at the vitriol at Good Reads and Amazon. That tells me not to read those posts. I’ll put this on my TBR list and try to wrestle it out of the library (i.e., get them to order it if they don’t have it in the system). An additional point: I’ve read interviews with Val McDermid, articles about her and seen her on video clips. She’s impressive, brilliant and incisive. Now I must read more of her books. I’ve only read one McDermid book, quite a few years ago, and all I can remember was it was too bloody for me. This one, though sounds like one I’d enjoy. I haven’t read any of her standalones – just a few of her Tony and Carol series – the last of which (Retribution) was great. Thank you for the review. I have read most of the Tony Hill novels – they are very twisted and bloody – but I havent been able to put them down. The writing style and story lines are addictive, very much look forward to reading some of her stand alones.